I grew up loving bhindi or okra but it wasn’t one of those vegetables I could drop into my shopping trolley at the local supermarket. When my mother was here last summer, she let out a high-pitched yelp on first sighting of okra or lady finger at the supermarket. My mother is prone to drama, as an Indian theatre actress. The skill I have sadly inherited is her drama queen antics and not her passion for the stage. One evening I decided to try out my favourite home recipe for bhindi with the newly supermarket-acquired veggie. A quick search around the blogosphere warned me about the slime that pours out of them like superglue. Chopping okra was a bit gooey, but it didn’t bother me. What’s a bit of edible glue when you’ve cried for onions and bled for garlic. 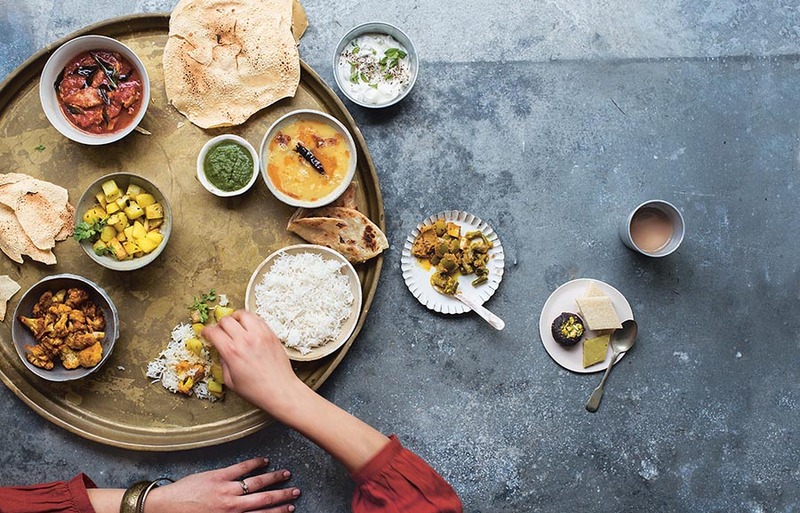 The recipe is very much quick and indian. We ate this with rice, as I had made dhal too. Eaten on its own, it’s dry and a better match with rotis, parathas or simply bread. Bhindi shrivels up and softens when cooked and can be deceptive when raw. Always use more than you think you’ll need. Wash chopped bhindi well and leave to dry. Heat oil in a frying pan, and when hot add the whole cumin. As the cumin sizzles up, add the onion and cook until translucent. Add the chopped bhindi and all the spices apart from the amchoor. Stir gently until the okra turns dark green and softens. Finally add salt to taste and sprinkle amchoor before serving. I always fry chopped Okra before adding them to any dish.Looks mouthwatering.Enjoy. Oh I Love this stuff….I just posted a recipe for Bhindi too…mine’s a bit different though! Amchoor is a nice twist…. well thats the way I usually make okra, except that the washing process is reversed. Okras must be washed and wiped really dry before you attempt to cut them. You will hardly get any slime that way. 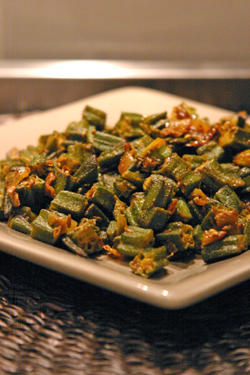 Besides that the reason water is rarely added in any Indian Okra dish, before the okras are cooked. I might need to give okra another shot (not a favorite veggie of mine yet). My response to your question about pesto was getting long so turned into a new post! Thats the way my mom makes it and I love it with paranthas, dahi and pickled onion. Evergreen recipe Mallika! Thanks so much for the tip ladies. My mother did ask me to wash and dry the okra first before cutting. But I didn’t see the logic in wiping the outside to get rid of internal slime! So I just ignored her. Basic lesson: always listen to your mother!! can I use frozen okra ? How to handle this ? Hi randi – just use frozen okra. It won’t make a blind bit of difference. Only difference is that you will get the slime while you are pan frying it and also it’ll be quite wet. So you have to keep stir frying until both the slime and the moisture go away. My frozen okra packs come with “cook when defrosted” instructions. Worth checking yours just in case. Made this tonight…top scores from my hubby! It was so good! My supervisor and I thank you your brilliant viewpoint dealing with i Masala – Pan fried okra at Quick Indian Cooking. Your composition might be terribly important principally for voters of San Manuel-Linn ! In Bhindi, it is always adavisable to add Onions after putting the chopped Bhndi in the kardai. question for jyoti….why is onion added only after adding bhindito the kadai? I know this is an old post, but I just had to leave a comment. I’m from the southern United States and fried okra is a staple here, too. Granted we usually dredge it in cornmeal before frying, it is very similar. Since I am now allergic to corn, I was looking for another recipe for fried okra that didn’t require my allergen (I don’t care for it battered with wheat flour or boiled which are other common southern preparation methods). This looks great and I have all the spices except amchoor (I’ll have to track this down). We can actually buy okra at all the farmers market around here, but rarely see it in grocery stores anywhere but the freezer section. Can’t wait to try this! four to five cashew grind ed paste added will give a rich taste to it. Okra is truly delicious. Add aamchoor (dried mango powder) to prevent it going slimey if you want to make it more saucy. You can then add water to the dish or more tomatoes.